Nearly missed this weeks Weekly Geeks! I had started the post and then forgot about it! I am passionate about a couple of other things I guess! No matter how much I can't stand my boss, I am passionate about my job, but that would be a pretty boring post wouldn't it! I am not too sure that passionate isn't too strong a word, but another thing I am enjoy a lot is watching sport! I am a total couch potato when it comes to watching sport. I am happy to watch nearly anything, particularly when it comes to the finals of any event. This year I managed to be off work for all of the Australian Open tennis. Whilst I have been in previous year to watch matches live that didn't happen this year, but I did watch an awful lot of games, until the very late hours of the night. WE have also been watching the cricket, despite the fact that the the national team hasn't been playing that well. I do like to watch the English Premier League and A League (Australian soccer) but I have had a tendency to fall asleep before the EPL games started lately. If I would have to pick a team to say I was passionate about, it is the Adelaide Crows, who play Australian Rules Football. The pre season tournament starts today. Fortunately the match is not here in Melbourne because we have another really hot day here (44C/111F) with a northerly wind. As an aside, these conditions are really bad if there is a bushfire. We have already had a number of bushfires, and lots over 30 homes in the city in the last couple of weeks, so fingers crossed there are no fires today. I was planning however to post about card making. The thing is though that so far this year, I have only made one thing (several times) which is pretty poor really! It's probably fair to say that I am passionate about buying things to do card making - not the actual making itself! One of the good things about doing the card making is that it is something that my sister, her mother in law and I all do, so it is something that we share together, and on the nights when we are getting together for workshops or just to make stuff, my son gets to spend time with his uncle so it is a win-win situation for all of us - well, maybe not the uncle but I think he has fun being babysitter! S0 what did I make? Bookmarks! And I am pretty happy with how they turned out, although I am struggling to get a good image of them to put on here. To many outsiders the Aussie Rules game appears to have precisely no rules but they are there I promise! What we do have is spectacular leaps and great marks (catches), full body contact and lots of excitement! To look at some of the other cards that I have made, click here! #3. Visit other Weekly Geeks. Link in your post to other Geeks who've peaked your interest in their passion. Or maybe you might find a fellow afincionado among us, link to them. For #3, you'll probably have to come back after other Weekly Geeks have posted. Well, because I am so late in doing in my post, the weekly wrap up post is already up here, so click on the link to see how many very interesting Weekly Geeks there are around blogland! I like your cards, they are really pretty! i had a look at all of them. And I like the bookmarks to. Very stylish! :-) Do you sell them and stuff or just do them for friends and family? I just do them for friends and family really. Marg, the bookmarks are really lovely! 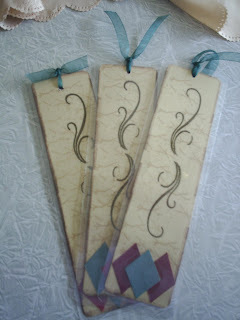 I love bookmarks like that for my books and the design you used is so pretty. I had to laugh when you said that you're more passionate about buying the supplies for card making than making them. That sounds like me and my knitting. Although I love to knit it seems I have much more of a knack for buying loads of yarn and stacking it up than I have for completing an actual project these days. lol. The sad fact is that I have spent about $60 on stuff this year so far, and have only made a few bookmarks! I am passionate about writing -- but only when I'm actually doing it. Right now, I'm taking a much-needed breather but when I decide on something new to write, that will be all I'll want to do. I would like to be more passionate about trying to get published -- I've written 5 full-length novels and 3 shorter ones -- so I need to get busy but don't seem to have the "fire" for that. I'm also passionate about dogs and educating people about neutering and spaying. And I'm passionate about educating folks that depression is not something you can simply snap your fingers and make go away -- and that it affects all types of people, in all kinds of situations. I never did get into Aussie Rules footy even in Adelaide. But I really miss watching and listening to cricket, which I can't get here in the US. I could listen online, I suppose, but it's always the middle of the night.